Every now and again, I find a dish that I like so much I do it over and over and over again. Like, for example, the Russian egg salad. Or, this cauliflower soup. And, let’s not even mention the whole #beetrootgate affair. This is one of those dishes, which has become one of the staples of last Winter (and Spring… and even Summer). It is just divine with smoked trout, baked salmon, cold cuts… And all this for less than 250 calories for a reasonable sized portion. Really, what not to like this salad? 2-3 oranges peeled (white parts out) and cut into 5cm chunks. Handfull of raisins or sultanas (or a mix of both). Place the sliced fennel in a salad bowl. Carefully remove the white bitter parts of the orange and slice the oranges to divide flesh sections. Add to the bowl Crush the roasted salted almonds with a mortar and tip in the bowl. Add the sliced radicchio In a small bowl whisk well the harissa, honey, coriander and white wine vinegar. Pour in the olive oil in a very thin stream (spoon by spoon), beating all the while. The sauce is ready when it you obtain a glossy, slightly thick mixture. Drizzle the harissa dressing over the salad and gently toss to combine. Serve immediately. Probably my favorite salad. Really loved the flavor combination, but most of all, the textures! Made this tonight with the salmon with orange chili ginger. 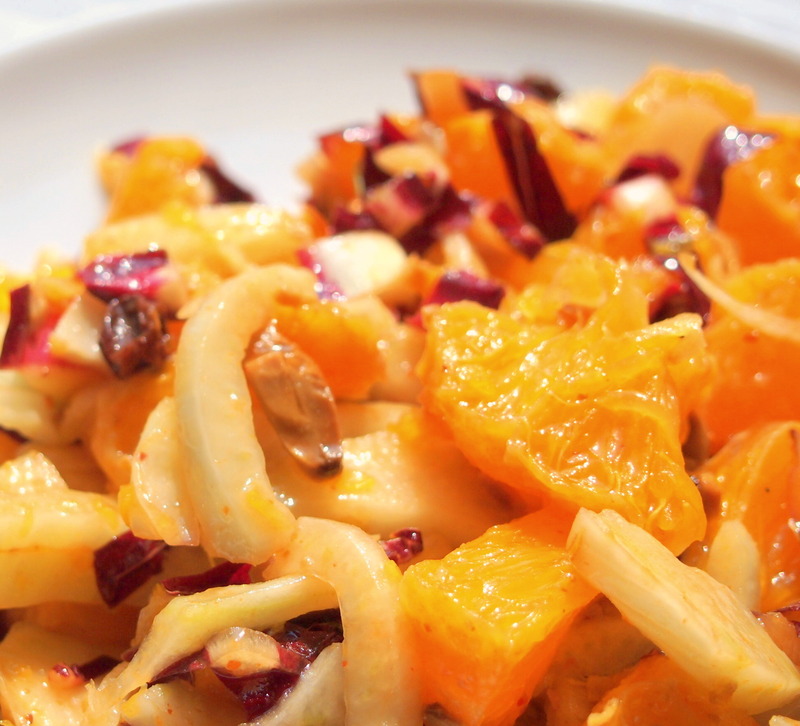 Added an avocado and some pomegranate seeds to the salad….absolutely delicious….thanks for posting these recipes! No problem – I am glad you liked it…. This is one of my favourite combination. Will try adding the avocado and pomegranate next time I do it.